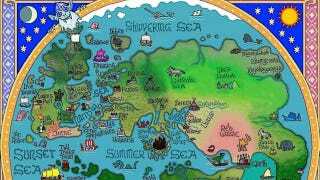 We've seen tons of attempts to map the Song of Ice and Fire world, but J.E. Fullerton's maps are an especially good fit for the medieval-inspired setting. His grand maps of Westeros and the regions beyond the Narrow Sea are filled with representative figures that capture the character of each part of George R.R. Martin's world. We've shown Fullerton's massive Westeros map before, but here we get a look at the individual cities and regions as well. These maps are reminiscent of the maps from Abraham Ortelius' Theatrum Orbis Terrarum, which depicted sea monsters waiting in the oceans. But Fullerton goes even further, depicting the peoples, beasts, landmarks, and household symbols found in each spot, giving us a greatest hits tour of the books. Unfortunately, Fullerton's deviantART gallery is no longer up, but you can see more of his fabulous maps at Taringa. Hat tip to Andreas.